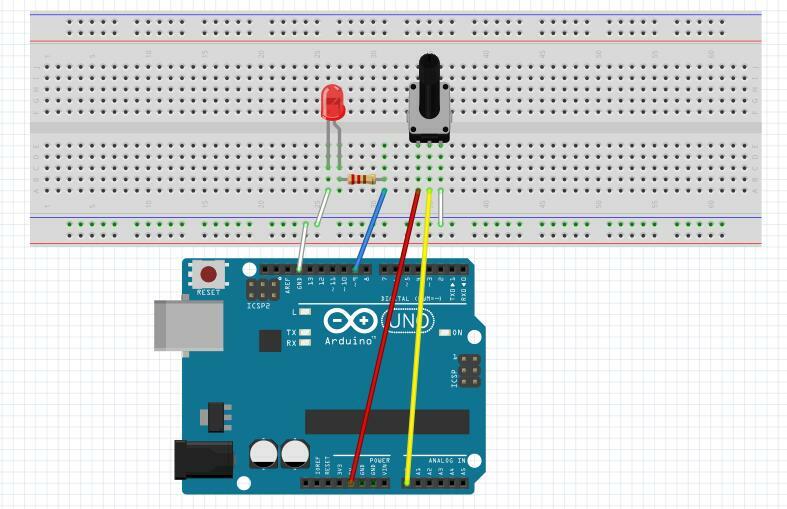 In this lesson, we will use a potentiometer attached to analog pin A0 and an LED attached to digital pin 9. We use the input from the analog pin to adjust the timing delay of a blinking LED. 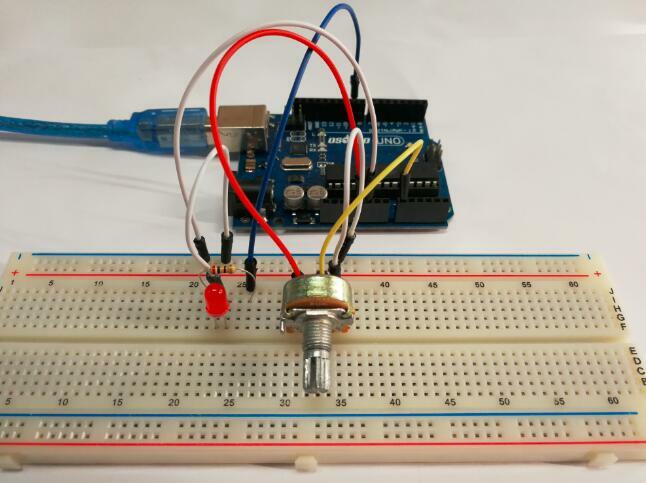 A potentiometer is a simple knob that provides a variable resistance, which we can read into the Arduino board as an analog value.In this example, that value controls the rate at which an LED blinks. So what’s the difference between an analog value and a digital one? Simply put, digital means on/off, high/low level with just two states, i.e. either 0 or 1. But the data state of analog signals is linear, for example, from 1 to 1000; the signal value changes over time instead of indicating an exact number. Analog signals include those of light intensity, humidity, temperature, and so on. In this lesson, a potentiometer, or pot, is used to change the current in the circuit so the blink rate of the LED will change accordingly. And since the pot is an analog device, the current change is smooth, thus the blink rate will gradually get faster or slower instead of going through an obvious stepwise process. What we mean by PWM here is the digitalization of analog signals, which is a process of approaching analog signals. Since the potentiometer inputs analog signals, it should be connected to analog ports, i.e. A0-A5, instead of digital ports. We connect three wires to the Arduino board. The first goes to ground from one of the outer pins of the potentiometer. The second goes from 5 volts to the other outer pin of the potentiometer. The third goes from analog input 0 to the middle pin of the potentiometer. By turning the shaft of the potentiometer, we change the amount of resistence on either side of the wiper which is connected to the center pin of the potentiometer. This changes the relative “closeness” of that pin to 5 volts and ground, giving us a different analog input. When the shaft is turned all the way in one direction, there are 0 volts going to the pin, and we read 0. When the shaft is turned all the way in the other direction, there are 5 volts going to the pin and we read 1023. In between, analogRead() returns a number between 0 and 1023 that is proportional to the amount of voltage being applied to the pin. In the previous course, you have learned how to control an LED by PWM programming, which is interesting though sounds slightly abstract. In this part, you will learn how to change the luminance of an LED by potentiometer. 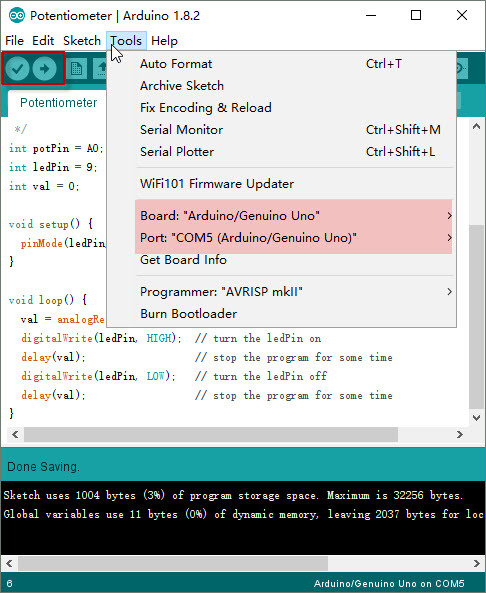 The circuit of this part is same as above.You can get the sketch from this link or copy below code to your new Arduino IDE window and upload it to your arduino board. Don’t forget to choose the corresponding board and port for you project! As you see, the potentiometer is connected to pin A0 of the Osoyoo Uno board, which can measure voltages from 0V to 5V. The corresponding returned value is from 0 to 1024. The measurement accuracy for voltage change is relatively high.